Precision, power, performance. The 10'-12' Magnaspread spreads lime at up to 2 tons per acre at 14 mph with a 60-foot swath. Fertilizer spreads at 80-foot-plus swaths. Optimized for a variety of high-capacity farming applications. Equipped with Salford BBI’s Binary Manifold. Are you interested in getting more information or a quote for the MagnaSpread? Please fill out the form below and one of our Territory Managers will be in touch shortly. Precision, power, performance. Spreads lime at up to 2 tons per acre at 14 mph with a 60-foot swath, spreads fertilizer at 80-foot-plus swaths. Optimized for a variety of high-capacity farming applications. Equipped with Salford BBI’s Binary Manifold, making connections to your precision agriculture electronics a snap. Why You Should Attend: Ag in Motion is Western Canada’s first outdoor farm expo, situated on 320 acres of prime agricultural land, just 15 minutes northwest of Saskatoon, Saskatchewan. In just its second year, the expo will feature live demonstrations of field equipment, crop plots, and interactive agribusiness exhibits. Join our team in booth 528 to learn more about Salford Group’s array of machines built for soil productivity! The winter ag show season comes to a conclusion as Salford territory managers Scott Ousdahl and Glenn Herperger team up with service manager Mitch Miller to make their way to beautiful Grande Prairie, Alberta for the Peace Country Classic Agri-Show. The BBI section control option will be making its debut at the 2016 National Farm Machinery Show in Louisville, KY. The section control option is able to turn off either side of the spreader in areas where fertilizer has already been applied. In Louisville, the section control option will be on display with Salford BBI’s newest model, the BBI Javelin. The BBI Spreaders road show continues, with the newly-added Nebraska Agri-business Exposition in Omaha rounding out the company’s January ag show circuit. BBI Spreaders is proud to join one of its key partners, Agro Chem, at the 34th annual Indiana-Illinois Farm and Outdoor Power Equipment Show in Indianapolis. This year’s show will take place at the newly-renovated West Pavilion at the Indiana State Fairgrounds from December 11-13. BBI Spreaders recently participated in the annual Farm Progress Show in Boone, Iowa, with Denny McCauley, Lee Kilpatrick, and Russ McEver in attendance on behalf of the company. 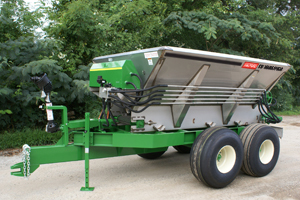 We were pleased to learn that one of BBI’s featured products, a MagnaSpread built with a 20-ton walking-beam suspension, was recently featured in Farm Equipment magazine’s show recap for the October/November 2012 issue. As BBI continues to grow in markets around the world, we look for partners with the right approach and business acumen for meeting the needs of sophisticated farming operations geared for precision agriculture. In Canada, we have begun such a partnership with Premier Equipment of Ontario. BBI Spreaders is proud to announce its participation in the 50th Farm Science Review, Ohio’s premier agriculture show, with our dealer partner for the area, Agro-Chem. Farm Science Review will take place September 18-20 at the Ohio State University’s Molly Caren Agricultural Center near London, Ohio. BBI Spreaders is proud to announce its participation, in conjunction with Spreader Specialties, in the September’s Big Iron Farm Show. The Big Iron Farm Show convenes over 800 exhibitors and more than 80,000 attendees at the annual event in North Dakota. The show will take place at West Fargo’s Red River Valley Fairgrounds from September 11-13. The BBI summer trade show circuit continues, with our participation in the 2012 IDEAg DakotaFest. DakotaFest, the premier annual agricultural event in South Dakota, will take place at Schlaffman Farm in Mitchell, South Dakota from August 21-23. The show connects industry-leading manufacturers with members of the Northern Plains farming and ranching communities. At BBI, we bring the best to the field by participating in a number of trade shows throughout the year, and we are looking forward to traveling to New London, Wisconsin for Wisconsin Farm Technology Days, the largest agricultural show in the state and one of the largest in the country.